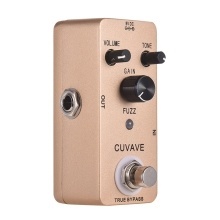 Fuzz effect pedal with vintage, old school tone like the serious distortion, dirty, strong and creamy. 3 knobs control: VOLUME/ TONE/ GAIN，customized your own tone. True bypass footswitch for switching between fuzz and bypass status.